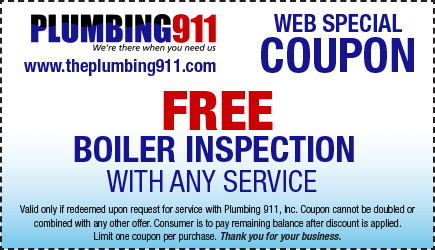 Plumbing 911 is your official boiler expert. Our expert boiler specialist can diagnose and service any boiler issue. In addition, we can help maintain your boiler with annual check-ups. Our boiler experts can save you costs by properly diagnosing services. We are here to service your existing boiler, not to replace it, unless necessary. When boilers are not functioning properly, it can create carbon monoxide leaks that can cause brain damage or serious illness. We can install alarms that are capable of detecting dangerous leaks. Reduced Fuel Bills: When boilers are running efficiently, it can result in huge savings on fuel bills. This is why homeowners must see to it that the boiler is working perfectly. It is important to take necessary precautions when fixing a boiler, and boiler repair experts have already received training in safety. They know how to handle boilers to ensure that heated water will not spill accidentally. Hot water can cause serious damage that can be irreparable.